Bird Migration: Remarkable Journeys, Narrative Non-fiction at it’s very best. Moonbird is about a remarkable superbird who has flown the distance equivalent to the moon and half-way back again in its life time. When I first read this book 8 years ago I remember being in awe of the migration journeys this bird (and other birds) make each and every year. It is one of my favourite all time non-fiction books. I have always been curious about how birds can navigate their way to such precise locations. This book doesn’t answer these questions. But, it did give me a fascinating insight into the annual journey of a rufa red knot (known as B95), a robin-sized shorebird. It opened my eyes to the multiple challenges it faces on its migration, and in particular finding enough food to give it enough energy for long flights. I gained an appreciation of the importance of stepping stones, key places that birds stop on their migration route where they can feed and re-fuel to be able to successfully complete the next stage of their journey. And how vulnerable these places are to changes , which are threatening the very existence of the red knot. 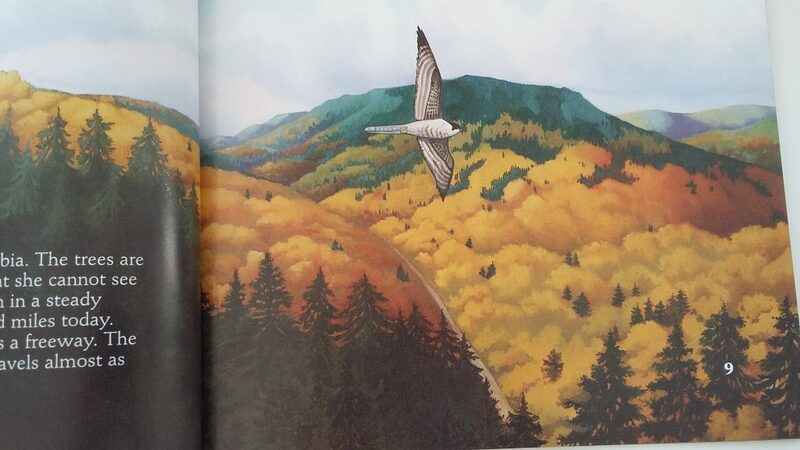 Since I discovered Moonbird I have been looking for a picture book that would communicate to a younger audience the excitement of a birds migration journey. 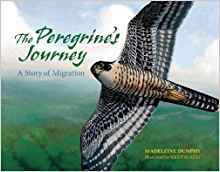 I found some quite good ones, but they did not follow or capture the magic of the journey in quite the same as Moonbird, until I discovered the Peregrines Journey: A Story of Migration, by Madeleine Dunphy and illustrated by Kristin Kest. What a gem of a book it is. It covers the Peregrine Falcons 8,000 Mile journey from Alaska (where it raises it chicks in Summer) to Argentina where it spends the winter. 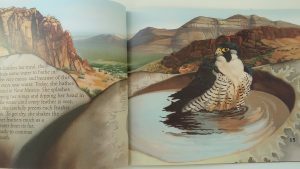 Kristen Kest beautifully captures with bold distinctive colours the different environments the Peregrine passes through. Madeleine’s Dunphy has the ability to make you feel like you are experiencing things from Peregrine’s perspective, with just the right detail to be informative and realistic. And the combination of author and illustrator create a story that flows beautifully, like the very best of narrative non-fiction should do. 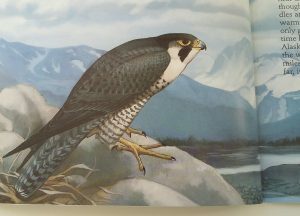 The Peregrine Falcon is a bird of prey so it eats other animals, including birds, and the red knot (but not in this story). How might you might ask can I possibly love both stories! Well the Moonbird won me over to rooting for and loving the very small red knot bird. But, I have always been fascinated and in awe of the birds of prey. In the story there are a couple of time’s that the Peregrine eats other birds, such as a Dove and a Pigeon, though you don’t see the eating part just the intent. Which may upset some younger children who do not yet understand that every animal or bird eats something to survive. 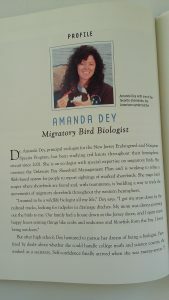 The core of the book focuses on the journey the bird B95 makes in one year. 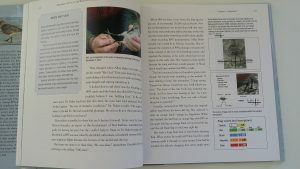 With a combination of prose written as you were actually were the bird, backed up with detailed information of the scientists involved, with pictures, maps and information boxes, this is the ultimate in non-fiction for young adults and adults. 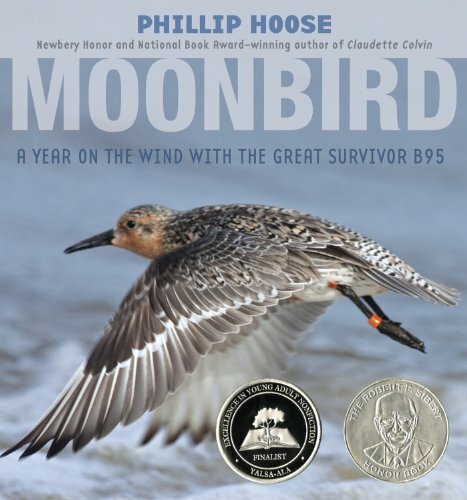 It also includes detail about how the scientists learnt about the red knot, tagged and tracked them and by doing this discovered just how far this remarkable survivor B95 or ‘Moonbird’ had travelled. 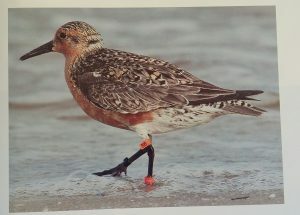 It concludes with a final chapter on what people are doing to save the red knot and an Appendix with ways you can help. I would highly recommend this for anyone aged 12 years and above, including adults. “Meet B95, One of the world’s premier athletes. Weighing a mere four ounces, he’s flown more than 325,000 miles in his life – the distance to the moon and nearly halfway back again. He flies at mountaintop height along ancient routes that lead him to his breading grounds and back”. The reader is taken on the birds amazing journey. From Tierra del Fuego (where he spends October to February) an archipelago (group of islands) off the coast of South America to Mingan Archipelago in Quebec, Canada. After capturing your attention with what it might feel like to be a small migratory shorebird about to embark on a long journey, and the need for it to stuff itself with food, such as worms, muscles, and tiny crustaceans to store reserves and propel its flight on it’s long journey. In a relatively small number of words and beautiful whole page pictures you get a unique insight into the awe-inspiring journey this bird of prey makes each year. You are taken through the birds experiences of flying, feeding, drinking, resting and watching as well as some of it’s stopping of places. I would recommend this for children aged 6 years to adult. But, for younger children do remember this is a bird of prey so it eats other birds and animals.